As part of building your shop, you're going to want to set up your postage charges. This is done in the "Postage & Tax" settings in your shop. In this guide we will be covering how to configure your Postal Zones and Types and offering some suggestions of what to consider when setting these up. Click on "Postage & Tax". 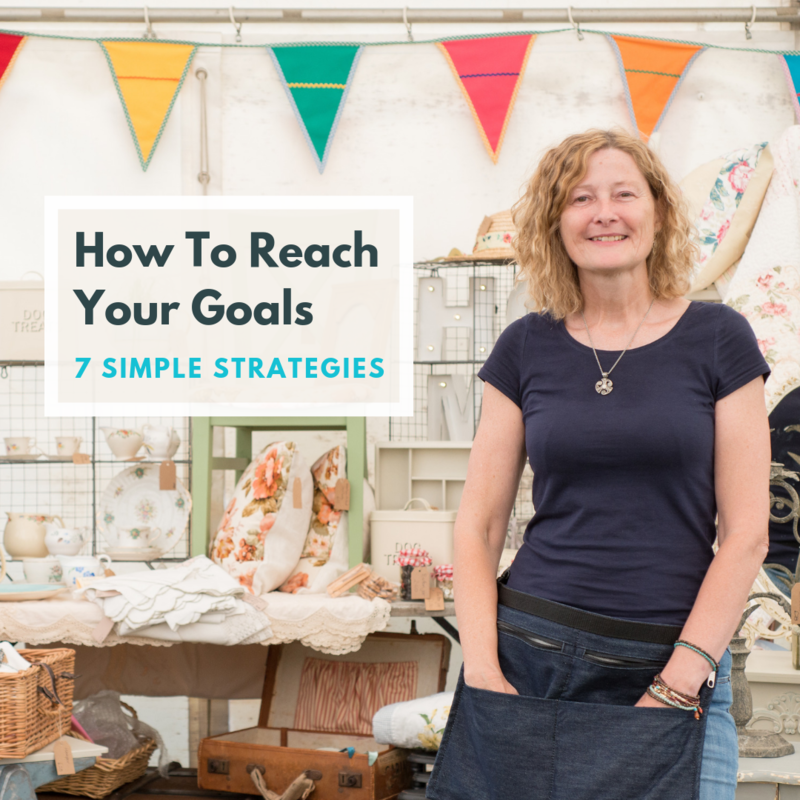 When working out how to charge your customers for postage, you may need to reflect on a number of factors. Where are you going to allow orders to be delivered to? Just your home country or internationally? Are you going to increase your product price a little to allow for free delivery? Are you going to accommodate for the cost of packaging in the postage charge? Are your products going to cost you roughly the same amount to ship? Could you charge a flat fee? Please consider these points as you read this guide, as this will help you to decide on which postage option will be the best for you. Your postage settings are configured using postal "zones". Each zone can have its own unique postage types. The two default zones that are already set up are "Home Country" and "All Other Countries". The "Home Country" zone is the country from which you will be sending your orders. The "All Other Countries" zone is optional and can be used for setting up postage charges for all other countries that have not already been selected in your other postal zones. However, if you wish to charge different postage amounts depending on which country you are delivering to, then you can set up further postal "zones". Click on the pencil icon next to "Home Country"
Select your "Home" country from the drop-down list for "Your Home Country"
Click on the link at the top of the screen for "Add New Delivery Zone"
Click on "Add New Delivery Zone"
Click on the pencil icon next to "All Other Countries"
"No, we only deliver to selected countries". Now that you have established which countries (or zones) you do and do not deliver to, you will need to decide on how you will charge postage for each of these. This is called a 'Postage Type'. For example, if you are based in the UK you could set up "Postage Types" such as "First Class", "Second Class" and "Special Delivery" in your "Home Country" zone. In the field "Delivery Type Name", give the name of the postage type that will appear on your checkout, for example "First Class"
This guide outlines how each of these Postage Types function below. You can also set up "Free Postage" for orders over a certain amount. This option charges one set postage amount per order. Simply enter the amount you wish to charge for all orders and click "Add New Delivery Type". This option charges postage based on the weight of the item in kilograms. This method requires you to set a postage amount per kilogram, for example 1kg = £4.99. Simply fill in the price per kilogram and click "Add New Delivery Type". 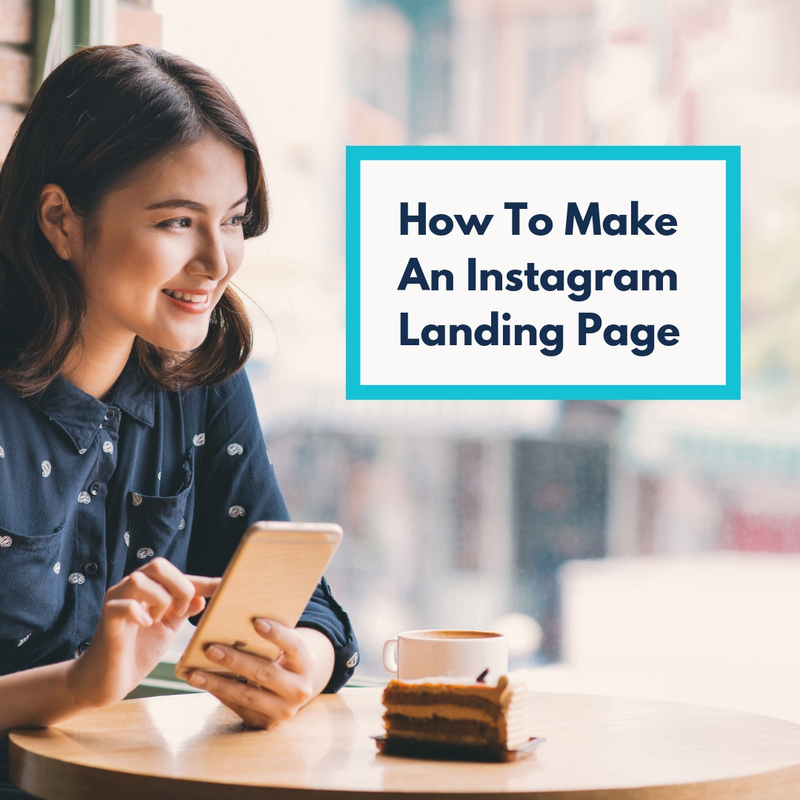 To use this method you will also need to add the weight of each of your products in kilograms. Enter the product weight in kilograms in the "Weight" field. For example, if you had a product that weighed 1g, you would enter "0.001", and if you had a product that weighed 100g, you would enter "0.100"
This option enables you to charge a set postage amount per item. For example, if you would like to set the postage charge to £1.00 per item, simply set the "Price Per Item" to "£1". Then, for example, when a customer orders three items, they will be charged £3.00 postage. This option will charge postage based on a percentage (which you can set) of the total order price. For example, if you set your percentage amount to be 10% of the order price, then an order that was £10.00 would have a postage charge of £1.00 applied to it. Simply enter your chosen percentage and click "Add New Delivery Type". This option enables you to set postage amounts based on weight groups. Here, you can charge an amount up to a certain weight. 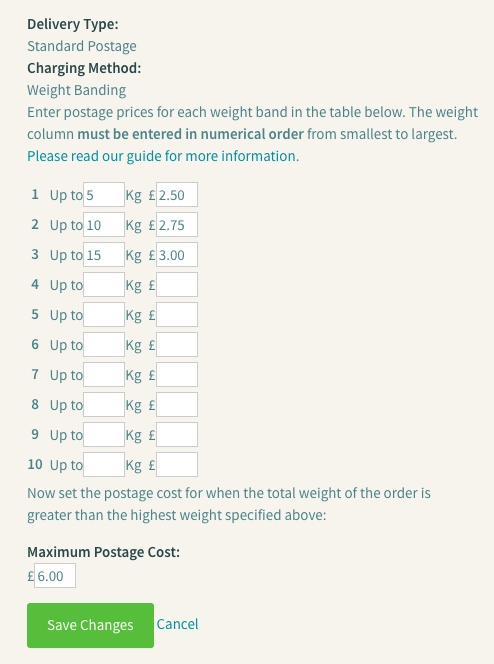 You simply enter postage prices for each weight band in the table. The weight column must be entered in numerical order, from smallest to largest. Please also ensure a Maximum Postage value is also entered. To use this method you will also need to add the weight of each of your products in kg. This option enables you to set postage price "Bands" based on the total order amount that you choose. For example, If you had an order for £20.00 then the postage charge would be £2.00. 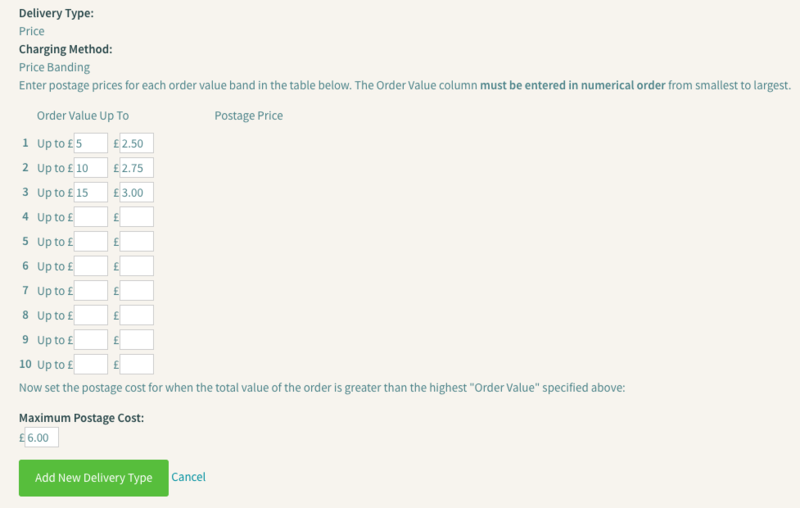 To set this up, simply enter the Order Value, then set a postage Price for that Value. 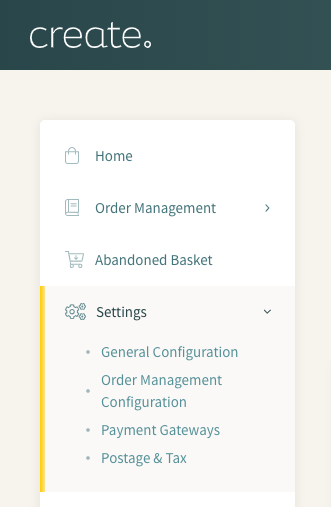 You can also set the "Maximum Postage Cost" so that any orders over your largest "Order Value" will be charged a set amount. In the example above, an order of £30 would have a postage charge of £6 applied to it.